Domaine de la Rose des Vents Coteaux Varois Rosé wine fresh and elegant! Domaine de la rose des vents rosé, a nice pale salmon color,nose citrus, and a fresh and well-balanced mouth , with a fruity and pleasant lenght, a lot of elegance! Domaine de la Rose des Vents rosé to be served cool (between 8 et 10°c). It is ideal during the summer for an aperitif and with salad, grills and tapas. Create at the beginning of the 20th century, the Domain de la Rose des Vents was passed on of generations in generations. Situated to Roquebrussanne, the vineyard extends over 40 ha. 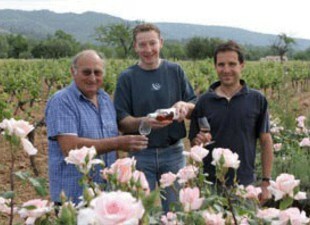 The Domain de la Rose des Vents is enlarges by exploiting a vineyard of Côtes de Provence from which arises the vintage "Jas d'Emilien". Wines of the Domain de la Rose des Vents in Coteaux Varois offer a light acidity but very refreshing for the apéritif. Vintages "Rose des Vents" and "Seigneur de Broussan" are of very good value for money. Both in the cellar and on the earth, Gilles Baude applies his knowledge in oenology, helped by Thierry Josselin, in the cellar too and also in charge of trade.